"This is the government we have - everything for miners and bullets for the people!" Farewell to three people killed in Celendin, Cajamarca. So commented Gregorio Santos, leftwing leader of Peru's Cajamarca province, in a rebuke last week to the country's president Humala. Santos was commenting on twitter, shortly after police opened fire on demonstrators protesting against Newmont's Conga gold project, in a confrontation which reportedly saw at least three people killed and over a score injured. Police also arrested, and abused, well-known civil society leader, Father Marco Arana, during the protests - he was later released. See: "The Devil's Operation," a documentary film about his activities and the state's attempt to stop them, can be viewed for free on Vimeo - (https://vimeo.com/14472835). LIMA, Peru (AP) - Police arrested and roughed up a prominent anti-mining activist in a northern provincial capital Wednesday, further inflaming tensions as the government imposed a state of emergency to quell increasingly violent protests against Peru's biggest mining project. The arrest of Marco Arana, captured on video that a local TV channel broadcast, showed riot police scooping the former Roman Catholic priest off a bench in the central square of Cajamarca and taking him away in a choke hold. Arana, a 49-year-old veteran of anti-mining protests, complained via Twitter that "in the police station they hit me again, punches in the face, kidneys, insults." Chief local prosecutor Johnny Diaz told The Associated Press that he had designated a prosecutor to investigate Arana's claim. Diaz said Arana was arrested for organizing meetings, an activity prohibited under the state of emergency. But the prosecutor said authorities had not issued any arrest warrants or made any mass arrests Wednesday. 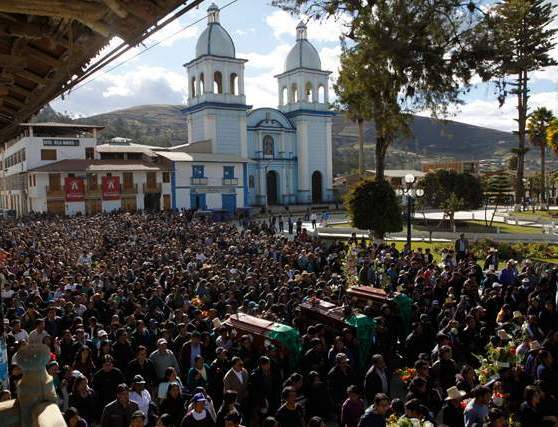 The state of emergency was imposed late Tuesday in Cajamarca province and two neighboring provinces after three people were killed during a violent protest in the region. It was the second emergency declared in five weeks to quell anti-mining protests. A 30-day emergency had just lapsed in Espinar, a highlands province near the former Incan capital of Cuzco where two people were killed May 29 while protesting against a copper mine. The object of Tuesday's protest is the $4.8 billion Conga gold mining project, which was suspended late last year by U.S.-based Newmont Mining Co. after protests by local people who insist the mine will hurt their water supplies. Newmont owns a majority stake in the project. President Ollanta Humala's government late last month announced conditions for allowing the project to proceed, but opponents backed by Cajamarca's provincial president, Gregorio Santos, vowed not to let it go forward. On Tuesday, protesters tried to storm the municipal hall in Celendin, a town that is a stronghold of resistance to Conga. Three civilians were killed and at least 21 people wounded. The regional health director said two of the fatalities died of gunshot wounds to the head. Authorities said some of the demonstrators had opened fire on security forces, wounding two police officers and a soldier in the legs. Associated Press writer Frank Bajak in Bogota, Colombia, contributed to this report. Washington, D.C. - The Inter-American Commission on Human Rights (IACHR) expresses its concern over the killings and the violence in Cajamarca Department, Peru, and urges the State to guarantee the life, the physical integrity and security of the people protesting against the mining project Conga. The Inter-American Commission also calls on the Peruvian State to use force exclusively to comply with its obligation to protect the people attending the demonstration and the members of the security forces, and only using the force strictly necessary, according to the internationally recognized principles. Finally, the IACHR calls all parties to cease violence and to find a peaceful solution of this conflict through dialogue, according to the existing Peruvian institutional mechanisms. According to the information received, five people were killed - including a 17 years old child - and tens wounded - including three policeman - as a result of violent clashes between the population and the security forces that took place on July 3 and 4, 2012. In addition, several personas were allegedly detained during the protests. The IACHR reminds the State of its obligation to conduct a judicial inquiry into the deaths of these persons and the acts of violence, sanction those responsible and repair the consequences. Furthermore, the Inter-American Commission reminds that it is necessary to adopt mechanisms to prevent excessive use of force on the part of public agents in marches and protest demonstrations. In this regard, the IACHR calls on the State to urgently adopt all necessary measures for the due protection of the protesters within the framework of respect of inter-American human rights standards. When carrying out security operations, the authorities should take the superior interests of children into special consideration and adopt all necessary measures to assure that children are protected against violence of any kind. According to the information received, human rights defenders that were conducting verification work in the area were allegedly victims of agression during the police operation. In this sense, information was received on the aggression suffered by Amparo Abanto, a lawer with the Coordinadora Nacional de Derechos Humanos (Human Rights National Coordination), and Genoveva Gómez, a lawer commissioned by the Office of the Ombudsman, by members of the Police when they were inquiring on the situation of the persons detained June 21 in the Plazuela Bolognesi. In addition, information was received indicating that excessive use of force was allegedly used in the detention of Marco Arana, a human rights defender participating in the protest and beneficiary of precautionary measures granted by the IACHR on April 23, 2007. Moreover, Marco Arana, who has been freed, said he was beaten during his detention. The Commission reiterates that acts of violence and other attacks against human rights defenders not only violate the defenders' individual guarantees as persons, but also assault the fundamental role they play in society and generate situations in which all those who benefit from their work are left defenseless. The Commission notes that the rights to association, assembly, and freedom of expression are fundamental rights broadly guaranteed by the American Convention on Human Rights. Given the importance of these rights for the consolidation of democratic societies, the Commission has maintained that any restriction of these rights should be justified by an imperative social interest. In this sense, the Commission observes that the States may impose reasonable limitations on protests with the objective of ensuring that they are peacefully carried out, as well as to disperse those protests that turn violent, so long as such limits are governed by the principles of legality, necessity and proportionality. As the actions of state agents must not discourage the rights to assembly, association and free expression, dispersion of a protest may only be justified under the duty to protect people. The security operations that are implemented in these contexts should contemplate those measures which are the safest and the least restrictive of the fundamental rights involved. The use of force in public demonstrations should be exceptional and strictly necessary in accordance with internationally recognized principles. Local authorities and social leaders in Peru's northern Cajamarca region must urgently appeal for calm, Amnesty International said after violence erupted at protests against a goldmine, killing at least four people. Since Wednesday, Peruvian authorities imposed a state of emergency in three northern provinces in response to the clashes, which have also resulted in more than 20 injured people - including civilians and members of the security forces - and scores of arrests over the past two days. "The worrying intensification of social conflicts over natural resources in Peru is paving the way for a series of grave human rights violations," said Guadalupe Marengo, Deputy Americas Programme Director at Amnesty International. "A full, independent and impartial investigation into the recent clashes is crucial, and those responsible for the loss of life must be held to account. Security forces may only use the minimum amount of force necessary to avoid loss of life or serious injury to themselves or others." Among those temporarily detained on Wednesday was Marco Arana, one of the leaders of the movement against the construction of Peru's largest goldmine nearby - known as Conga - which is overseen by US mining firm Newmont and a local subsidiary. Marco Arana reported that police beat him in custody. Amnesty International is deeply concerned about the situation of detainees and the ability of human rights defenders to carry on their work without fear of reprisals. "Even in a state of emergency the authorities must respect individuals' right to life and physical integrity, and detainees must be guaranteed their due process rights," said Guadalupe Marengo. LIMA - Peruvian lawmakers on Thursday harshly criticized President Ollanta Humala's crackdown on protests against Newmont's $5 billion Conga mine, as deadly violence prompted calls for him to shuffle his Cabinet. A fifth protester died on Thursday after two days of clashes with police as left-wing leader Marco Arana, a soft-spoken former Roman Catholic priest who has rallied demonstrators to stop construction of the biggest mine in Peruvian history, was released from police custody a day after a video aired on local TV showed him being detained and beaten by police. He was ostensibly detained for violating emergency rules that suspended the right to protest in the northern region of Cajamarca. "The government is mistaken if it thinks that with bullets, torture and punches it will control the just demands of Cajamarca," Arana said at a news conference. "The president shouldn't just defend investment. He should defend the fundamental rights of Peruvians." Arana, who is widely thought to have ambitions to seek the presidency in the 2016 election, and his allies on the left say Humala has drifted too far to the right since taking office last year. They say the president has put the interests of global miners ahead of those of poor peasants to ensure that $50 billion in planned mining projects get built in one of Latin America's fastest-growing economies. Opponents of the Newmont mine say it would cause pollution, hurt water supplies and fail to generate enough local economic benefits. Humala has backed the project as a generator of thousands of jobs and enormous tax revenues. Humala, a former military officer, has not spoken about the violence this week - even as his ministers suspended freedom of assembly to quell the rallies and opposition lawmakers urged police to show more restraint. Five lawmakers who left Humala's Gana Peru in the last few weeks over ideological differences urged Prime Minister Oscar Valdes and Interior Minister Wilver Calle, both former military officers, to quit. "We demand they quit immediately ... for their manifest political and administrative incapacity to resolve the social conflict that exists in Cajamarca," the lawmakers wrote in a public letter. The clashes this week, the first in eight months of protests against the mine, marked the biggest political setback for Humala since the first round of protests against the Newmont mine prompted him to shuffle his Cabinet in December - after only five months in office. Peruvian leaders normally shuffle their Cabinets around July 28, Peru's Independence Day, and expectations are growing that Valdes will be pushed out. Right-wing lawmaker Keiko Fujimori, who narrowly lost to Humala in last year's election but whose party has sometimes lent him support in Congress, urged her former rival to show more leadership. "President Humala: grab the bull by its horns. Leave the comfortable presidential palace, stop taking foreign trips and go fight the enemies of Peru," she said while criticizing "radicals" for trying to stop progress. Humala took office urging mediation to solve hundreds of disputes nationwide over natural resources, but he has lost patience with protesters and has suspended civil liberties to curb demonstrations at least three times. Members of Humala's party have blamed Arana and another strident opponent of the mine - Gregorio Santos, the president of the Cajamarca region - for inciting violence at a rally of 2,000 people on Tuesday where protesters threw rocks and vandalized public buildings. The rallies spilled over into Wednesday. Official data shows at least 15 people have died during Humala's term in protests over natural resources, compared with 174 who were killed in similar circumstances from 2006 to 2011 when Alan Garcia was president. Amnesty International urged all sides to show more restraint to avert further violence. Health officials said this week's five victims were killed by rounds of live ammunition - contradicting statements by the police that only rubber bullets and tear gas were used to disperse crowds. U.S.-based Newmont's project in Cajamarca, known as Conga, is partly owned by local miner Buenaventura and would produce between 580,000 and 680,000 ounces of gold annually. Conga would essentially replace the nearby Yanacocha mine run by Newmont and Buenaventura that is nearing the end of its life. Protesters have expressed outrage that Humala gave the miner permission a week ago to proceed with construction of the project after Newmont agreed to comply with a more stringent environmental mitigation plan recommended by outside experts. Newmont has agreed to build larger reservoirs that would replace two or more in a string of alpine lakes and guarantee year-round water supplies in towns that suffer during the dry season. It started work on those reservoirs over the weekend after nearly all construction work on the mine had been stopped since November because of protests. The company's local office said on Tuesday the violence was unfortunate, but that the company was "reaffirming its commitment to Cajamarca." Peru, which has vast mineral resources, is the world's second-largest producer of copper and sixth of gold, but many mining communities suffer from widespread poverty and complain a decade-long economic boom has passed them by. LIMA - One person died and police detained one of the leaders of protests against Newmont's $5 billion gold mine in Peru on Wednesday, the day after clashes between police and protesters left three people dead and 21 injured. 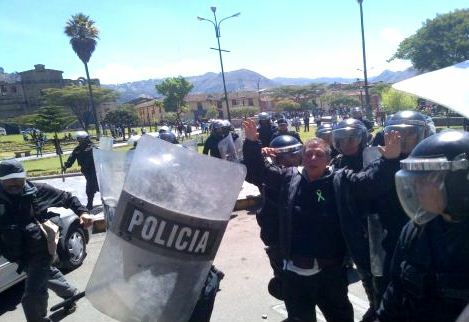 The second day of violence erupted in the northern region of Cajamarca as President Ollanta Humala came under criticism for suspending freedom of assembly in the area late on Tuesday. "One death has been confirmed, a civilian," Prime Minister Oscar Valdes told a press conference. Left-wing leader Marco Arana, a soft-spoken former Roman Catholic priest who has rallied demonstrators to stop construction of the biggest mine in Peruvian history, said police had beaten him and local TV showed photographs of authorities taking him away. "They detained me and beat me a lot, inside the police station they beat me again - punches in the face, the kidneys and insults," Arana said via Twitter. Arana is widely thought to have presidential ambitions. He and his allies on the left say Humala has drifted too far to the right since taking office and has put the interests of global miners ahead of poor peasants. Humala, a former military officer, says the mine proposed by the U.S.-based Newmont would generate thousands of jobs and huge tax revenues. Protesters say it would cause pollution, contaminate water supplies and fail to bring local economic benefits. Opposition lawmakers and human rights groups denounced Arana's detention as part of a harsh crackdown by Humala - who took office a year ago urging mediation to solve hundreds of disputes nationwide over natural resources but has been quick to suspend civil liberties to quell protests. Humala has implemented emergency measures involving the suspension of civil liberties at least three times in the past year. He also arrested a mayor in the southern region of Cusco in May for leading a protest against global miner Xstrata. "What we have here is a repressive attitude, which is violating the rule of law, and an intelligence service that is working for the mining sector," said Congressman Jorge Rimarachin, who once supported Humala but has defected from his party. "This is totally unacceptable." Members of Humala's party blamed Arana and another strident opponent of the mine - Gregorio Santos, the president of Cajamarca region - for inciting violence at a rally of 2,000 people on Tuesday where protesters threw rocks and vandalized public buildings. "The only person responsible for this is Mr. Santos," said lawmaker Teofilo Gamarra of Humala's Gana Peru party. Official data shows at least 14 people have died during Humala's term in protests over natural resources, compared with 174 who were killed in similar circumstances from 2006 to 2011 on the watch of his predecessor, Alan Garcia. Newmont's project in Cajamarca, known as Conga, is partly owned by local miner Buenaventura and would produce between 580,000 and 680,000 ounces of gold annually. Conga would essentially replace the nearby Yanacocha mine run by Newmont and Buenaventura that is nearing the end of its life. Newmont has agreed to build larger reservoirs that would replace two or more in a string of alpine lakes and guarantee year-round water supplies in towns that suffer during the dry season. It started work on those reservoirs over the weekend after nearly all construction work one the mine had been stopped since November because of protests. The company's local office said on Tuesday the violence was unfortunate, but said it was "reaffirming its commitment to Cajamarca." Three people were killed and 21 injured on Tuesday when Peruvian police clashed with protesters opposed to a $5 billion gold mine planned by Newmont Mining, officials in the northern region of Cajamarca said. The fatalities were the first in Cajamarca since protests against the mine started there late last year and the government has responded by suspending freedom of assembly to quell clashes between police, soldiers and protesters. "I don't think we Peruvians should tolerate bad apples who incite violence that ends up causing deaths," Prime Minister Oscar Valdes said. Most of the victims were being treated in the city of Cajamarca and the town of Celendin - the flashpoint of violence between 2,000 protesters and police and near where the U.S. company plans to build the biggest mine in Peruvian history. The interior ministry said two of the injured were police officers who were shot by gun-carrying protesters who also threw rocks, damaged public buildings and were repelled with tear gas. "Unfortunately there are three dead ... from gunshot wounds," Miguel Castillo, a regional judicial official, said on RPP radio. President Ollanta Humala, a former military officer, took office a year ago, urging mediation to solve hundreds of disputes over spoils from natural-resource projects. However, he has since used emergency rules at least three times to end anti-mining protests in one of the world's top metals exporters. Critics say the harsher measures are symptomatic of his drift to the right. Official data show that at least a dozen people have died during Humala's term in protests over natural resources, compared with 174 who were killed in similar circumstances from 2006 to 2011 on the watch of his predecessor, Alan Garcia. Protesters have halted nearly all work at Newmont's Conga mine since November, saying it would cause pollution, harm water supplies, and fail to bring enough local economic benefits. The president of the region of Cajamarca, Gregorio Santos, who has been a strident critic of the proposed mine, accused Humala's government of putting big miners ahead of poor peasants left behind by the country's decade-long economic boom. "This is the government we have - everything for miners and bullets for the people," he said on Twitter. "Humala, this is the cost of defending the savage neoliberal economic model and multinational miners. This is the cost of not keeping your word." Humala has said the project is vital for Peru as it would generate thousands of jobs and huge tax revenues in one of Latin America's fastest-growing economies. Getting the project built would send a strong signal to investors that the government won't allow disputes over natural resources to further delay projects in its $50 billion pipeline of planned mines. Once a firebrand leftist, Humala has irked traditional allies on the left by defending foreign investment and free trade since taking office a year ago. Over the weekend, leaders of the protests, including Wilfredo Saavedra, a lawyer who once belonged to the Tupac Amaru insurgency, vowed to take tougher measures to stop the mine. Protesters have expressed outrage that Humala gave permission a week ago to proceed with construction of the project after Newmont agreed to comply with a more stringent environmental mitigation plan recommended by outside experts. Humala's green light ended a seven-month-long impasse over the mine's future. Newmont has agreed to build larger reservoirs that would replace two or more in a string of alpine lakes and guarantee year-round water supplies in towns that suffer during the dry season. The company's local office said the violence was unfortunate, but that it was "reaffirming its commitment to Cajamarca" and urged all sides to reach an understanding. On Monday, Humala responded to threats of new rallies by saying protesters would have to "face the consequences" of their actions. Conga, which is partly owned by local miner Buenaventura, would produce between 580,000 and 680,000 ounces of gold annually. LIMA, Peru - Protesters opposed to Peru's biggest mining project attacked a provincial town hall and battled police and soldiers Tuesday in violence that claimed three lives and injured at least 21, authorities said. Police guarding the municipal building in Celendin, a town in the northern state of Cajamarca, fought back when the protesters attacked and later got help from soldiers, officials said. Peru's Interior Ministry said gunshots were fired by protesters, but did not say whether police or troops used their weapons. Three men were killed during the fight, at least two of them by gunshots to the head, Reynaldo Nunez, Cajamarca's health director, told The Associated Press by phone. Most of the injured had received blows, he said. Nunez said he did not know whether police or soldiers were among the injured. The Interior Ministry's statement said two police officers were wounded by bullets fired by protesters. Celendin is a stronghold of opposition to the proposed $4.8 billion Conga gold mine, which many locals fear will hurt their water supplies. The mine's majority owner is Newmont Mining Co., a U.S. company based in the state of Colorado. Backed by Cajamarca's regional president, protesters have refused to accept a compromise proposed by President Ollanta Humala that his government says will protect water supplies. The compromise includes the construction of four reservoirs to replace reservoirs that are to be destroyed by the project. Celendin's town manager, Moises Silva, told the AP that violence broke out when construction workers arrived at the town hall and began kicking its main door, prompting police officers to fire tear gas. "After that, a fierce battle began between the protesters and police, and also soldiers who intervened in support of the police," he said. "You could hear gunshots." The violence came just days after Yanacocha, the company in charge of Conga, began work on the new reservoirs. The anti-mining protesters accuse Humala, who was elected one year ago, of betraying a campaign promise he made in Cajamarca that access to clean water would come before mining. His government says responsible mining can co-exist with environmental protection and provides important revenues that can help lift rural Peruvians from poverty. Mining accounts for more than 60 percent of Peru's export earnings and has been the engine of a decade-long economic boom. LIMA (IPS) - Peru was certified as compliant with the global standard of the Extractive Industries Transparencies Initiative (EITI) earlier this year. However, its achievements have not satisfied the demands of the local population in mining and oil extraction zones. Some 60 delegates of the international EITI board met in Lima on Wednesday and Thursday Jun. 27-28 to evaluate the adoption of stricter standards, because the activities of the mining and oil industries in Peru are not translating into sustainable development in local communities. The sessions were marked by lengthy debates between representatives of the government of President Ollanta Humala, mining companies, civil society organisations and multilateral bodies like the Inter-American Development Bank (IDB) and the World Bank. Peru is the first country to qualify as EITI-compliant in Latin America, the region with the fewest governments participating in EITI, although it is hoped that more countries will gradually join the initiative. Colombia has recently committed to implement EITI, while Guatemala and Trinidad and Tobago are aiming for compliance. "Instead of just providing transparent information about revenues from natural resources, people really need to know how the resources are distributed and used," economist Epifanio Baca, a leader of the Citizen Proposal Group (GPC), a member of the international EITI Board and a representative of civil society on the Peruvian EITI National Committee, told IPS. "Accounting for how the income is spent is essential because it has a positive impact on improving people's quality of life," he said. Founded in 2002, EITI is a global effort to get extractive industry companies to publish information about their tax and non-tax payments to the state, as a means of avoiding corruption. So far, 35 countries have joined the initiative and 14 have been certified as compliant with the transparency standards, including Peru. But being able to see how much the government is receiving from companies extracting natural resources has not diminished discontent among people living in mining or oil extraction areas, as Humala recognised Tuesday Jun. 26 at a conference on "Open Government and Transparency in Extractive Industries in Latin America and the Caribbean," which preceded the EITI board sessions. "It is still not enough to heal the cracks and fissures in our social fabric that date back to the birth of our republic. We need to do more," Humala said. In recent years Peru has lived through considerable social upheaval. During the government of president Alan García (2006-2011) the number of social conflicts shot up from a total of 82 in June 2006, to 217 in June 2011. Most of the conflicts were over social and environmental issues, and they have taken a heavy human toll: close to 200 people were killed and over 2,000 were injured during protests between January 2006 and September 2011, according to reports from the ombudsman's office. Prospects have not been much more encouraging during the Humala administration, which has still not won over opponents of the controversial Conga mining project planned by Minera Yanacocha in the northern department (province) of Cajamarca., owned by the Colorado-based Newmont Mining Corporation. Humala has just given the green light to the Conga project, which is not surprising since the extractive industry accounts for 75 percent of the country's export earnings, according to Minister for Energy and Mines Jorge Merino. EITI partners agree that transparency in extractive activities could contribute to calming social conflicts, not only in Peru but also in other Latin American countries. Meanwhile, some civil society organisations belonging to the international EITI board argue that it is necessary to raise its standards and to decentralise information. Baca said regional and municipal governments should also be held accountable and be required to provide accurate, comprehensible and straightforward information. Kurt Burneo, a former Peruvian minister of production, agreed with Baca. "If you want social legitimacy, you have to build trust, and this will not happen without transparency," he told IPS. Carlos Aranda, technical services manager for the Southern Peru Copper Corporation and a business representative on the EITI-Peru National Committee, said it was important for companies not to hide behind anonymity, but instead to provide more and more information. "Transparency is important, but we can't report environmental impact studies in the main square, so that everyone can hear all about them. We can't carry on suspecting everything and everyone and presuming there is always a deal going on under the table," Aranda told IPS. But the problems of distrust and disputes involving extractive industries are not exclusively a Peruvian preserve. Célica Hernández of the Jubilee Foundation, a Bolivian NGO, told IPS that at the end of 2011, 2.2 billion dollars of natural resource revenues had not been disbursed by the various government agencies in Bolivia, an amount similar to the national income from oil and gas operations. "Bolivians are really angry about this," Hernández told IPS in a break between meetings. Bolivia has not joined EITI, but civil society groups are working to promote transparency. In Colombia, too, conflicts are breaking out in some areas, according to Carlos Andrés Cante, the head of "mining formalisation" - responsible for regulating artisanal mining - in the Ministry of Energy and Mines. However, Colombia is still experiencing a boom in exploration, since most mining projects have not yet reached the production stage. Colombia is already working on setting up a national EITI committee and making transparency part of state policy, Cante told IPS. The countries of the region are progressing at different rates, but "increasingly, companies and governments are realising that no advances in this area can be achieved while secrecy and lack of legitimacy persist," Baca said.